Geo Vision 16 camera in-put capture card w/30pf/s recording and Display w/ 1 Audio Software include 16 BNC Input. Total 30fps (NTSC) Recording Rate @ 320x240 Resolution. Full D1 Video Resolution. Mpeg4 / H264 Compression Formate. OS Support: WIndow XP / Window Vista / Window 7 / Dindow Server 2008. 1 Year Warranty. 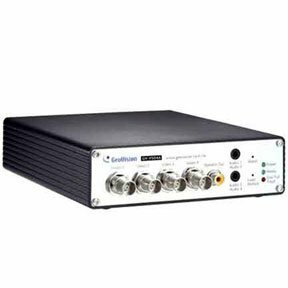 GeoVision 4 camera input capture card w/30pf/s recording and Display w/ 1 Audio Software include 4 BNC Input. Total 30fps (NTSC) Recording Rate @ 320x240 Resolution. Full D1 Video Resolution. Mpeg4 / H264 Compression Formate. OS Support: WIndow XP / Window Vista / Window 7 / Dindow Server 2008. 1 Year Warranty. Geo Vision 8 camera in-put capture card w/30pf/s recording and Display w/ 1 Audio Software include 8 BNC Input. Total 30fps (NTSC) Recording Rate @ 320x240 Resolution. Full D1 Video Resolution. Mpeg4 / H264 Compression Formate. OS Support: WIndow XP / Window Vista / Window 7 / Dindow Server 2008. 1 Year Warranty. IP Base Server for PD Series PT/PTZ Camera. M-JPEG. MPEG-4 Dual Stream Compression. Free 16CH software include. VGA/PS2 Cat5 Extender support up to 1600*1200 1Cat5e Cable require. up to 1000Ft. Transmission distance of up to 1000ft / 300m. Transmission via UTP CAT5/5e. Extends VGA video. keyboard and mouse signals. Real-time transmission. Built-in brightness and contrast adjustors. Power through USB in host unit and 12V DC only in remote unit. High video resolution depends on the length and quality of UTP cable with standard resolution 1024x768 and up to 1600x1200 @ 60Hz. Exceptional interference rejection. Built-in transient protection. Multiplatform support: supports PC. Mac. Sun. and Linux systems. Supports VGA. SVGA. XGA. SXGA and Multi-sync monitors. OS Support: Windows 2000. Windows XP. Linux. Mac and Sun. All kinds of DVR/NVR servers are available at SF Cable and eligible for delivery at your door steps. We have a wide range of DVR/NVR server including products like GeoVision 16 Camera Input Capture Card, GeoVision 4 Camera Input Capture PCI express Card, GeoVision 8 Camera Input Capture Card, IP Base Server for PD Series PT/PTZ Camera, and 9CH Monitoring and Recording NVR server. SF Cable brings to you quality products at affordable prices. All our products are RoHS compliant and environment friendly. We ensure that the customer is happy and satisfied with the product by providing good after sale services and lifetime technical support on all our products.